The Yonsei Memory Project strives for intergenerational healing through arts, storytelling, digital mapping and cross-cultural collaboration. Nikiko Masumoto and Brynn Saito — Yonsei artists from Fresno, Calif. — reunited in February at the Fresno JACL’s annual Day of Remembrance event, which took place in collaboration with California State University, Fresno, to mark the 75th anniversary of Executive Order 9066. Masumoto and Saito observed that the gathering stood apart from other programs. A stark reality was present: There were few Nisei left in the program’s audience. In conversations following the event, Saito and Masumoto realized that they shared an urgency to do “memory work.” They asked questions of themselves: How could we, as Yonseis, utilize our particular backgrounds as artists, poets, writers and organizers to awaken the archives of memory? How could we draw connections between the experience of the Japanese American community and communities currently targeted by racist and dehumanizing policies? As Yonseis of the millennial generation carrying multicultural histories, how do we honor our unique role? What does this moment ask of us? Born from such inquiries, Masumoto and Saito founded the Yonsei Memory Project, a unique interdisciplinary initiative exploring Japanese American experiences — in particular, the incarceration experience during World War II — through familial and community connections, in addition to using the modalities of storytelling, visual arts, poetry and creative facilitation. In August, YMP launched its innovative programming and community work, supported by grant funds from the California Civil Liberties Public Education Program via the California State Library and through fiscal sponsorship by the Fresno Arts Council. Combined with independent fundraising and many in-kind community donations, YMP is making spaces to surface and discuss Japanese American history while drawing connections to the struggles of today, all in an effort to create avenues of healing. The project’s focus is both intimate and public: YMP facilitates small groups to explore deep questions, while simultaneously building a collective digital memory map of important memorial sites for the Japanese American community in the Central Valley and preparing for a public Day of Remembrance program. YMP’s inaugural gathering took place in August in California’s Central Valley. This first occasion exemplified the kind of transformative experiences at the project’s core. Fifteen people gathered in the early morning and boarded a small bus to experience a memory journey in and around Fresno County, led by Saito and Masumoto. Named “Intergenerations,” the gathering was intentionally curated to bring together diverse people with different generational connections to the Japanese American community: passengers included Nisei, Sansei, Yonsei and to-be-parents of a Gosei. The group included people from many races and family structures, some adopted, some hapa, some queer. Participants engaged in lively conversation, while the shuttle rumbled by Fresno streets named for soil and trees — Cedar, Chestnut, Willow, Maple — signatures of a thriving Central Valley. The bus stopped at two particular memory sites in Fresno. Participants deboarded at the first, the Pinedale Assembly Center Memorial. The memorial was developed by the Central California District Council of JACL in the Central Valley with the support of many community members and organizations. Several panels with dense text and historic photos tell a familiar story of Japanese American forced removal, detention at “assembly centers” such as the Pinedale location, incarceration in concentration camps, resettlement and redress. But, this morning’s visit was unlike a typical tour. Participants were given notebooks and invited to engage with the site through heightened awareness of their senses, recording — like citizen journalists, documentary poets — what they saw, heard, felt and touched. The point of the activity was not only to re-educate and refamiliarize the group with a shared community history, but also to ask: What are the mechanisms through which histories are remembered? What are the specific choices made in how we memorialize the past, and whose past is remembered? Once back on the bus, participants reflected on what stood out in their observations and what questions remained. At the next stop, the group visited a private business, Simonian Farms. Several years earlier, the owner, an Armenian American farmer, Dennis Simonian, constructed a memorial “soul consoling tower” out of reclaimed wood from barracks at the Poston incarceration camp. Here, each participant paired up with another to take a moment of silence while standing inside the narrow room at the base of the tower. Each pair held hands for about a minute. This simple movement exercise invited people of different generations to literally connect through touch and be present, while surrounded by a structure built from the camps. A few participants began to weep at the immensity of the experience. “I appreciated the impact the day’s experiences were making on [my partner] and on me as I held her hands and looked into her eyes. It made the experience personal to me,” said Saburo Masada, a Nisei leader and educator. The day concluded with more sharing of family stories, memories and feelings, as well as the creation of a first draft of a “Collective Memory Map,” which noted sites of community significance. “I love history. I knew our stories because we have told them to schools, universities and clubs. Instead of feeling sad about our JA history being forgotten or not being carried on by our own future generations, I was so filled with hope and appreciation for what [the Yonsei Memory Project is] doing to preserve our stories!” said Marion Masada following the program. Marion Masada’s reflection highlights a crucial notion: There is a need for the Yonsei generation to make its mark in carrying community histories. The question that drives the Yonsei Memory Project is: How do we (want to) remember Japanese American experiences? While there have been many successful efforts both within the Japanese American community and in the larger American public to document, archive and understand what happened preceding, during and after World War II, YMP builds upon this work through a slightly different approach. Rather than viewing history as something that is completed, YMP uses the lens of “living memory”: Memory is alive and requires constant nourishment or else it falls prey to misunderstanding and erasure. YMP takes to heart the reality that for many families and for the Japanese American community as a whole, the Yonsei, in many cases, are the last generation to know survivors of the camps firsthand. Tsutsui’s reflection translated into a somber and urgent responsibility for the co-founders of the YMP. Additionally, the current political climate in the history of race and racism in the United States adds urgency. The August memory journey took place just two weeks after the white supremacist rally in Charlottesville, Va., when supremacists rallied with claims of defending the Confederate statues in that city. There is no question: Memory work is political, memory is alive and the country has not reconciled its racist legacies with the need for healing. 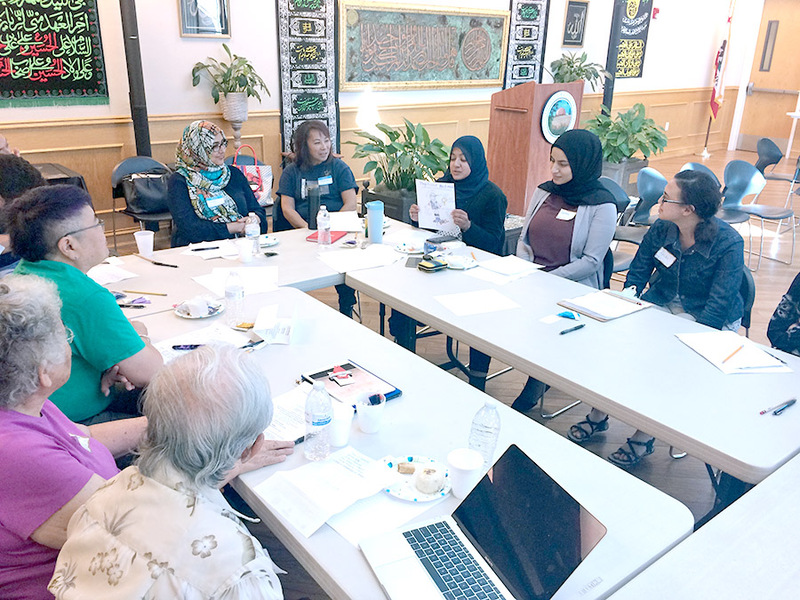 Such urgency led YMP to explore contemporary struggles for justice and civil liberties by coordinating events in partnership with the Muslim community in Fresno. From a feminist samurai heroine to the “Magnificent Muslimah,” participants allowed themselves to be playful and brave, calling forth the imaginative energy that fuels hope, healing and a deeper awareness of the struggles affecting fellow citizens. “When will we begin to understand that our liberation must be bound to the liberation of all communities?” added organizer Sukaina Hussain. This question speaks to the essential work of breaking down boundaries between communities and resonates with the core beliefs of YMP. Although the YMP is primarily focused on memory work in Fresno County, the project has also collaborated with Japanese American writers, artists and organizers in the Bay Area and Los Angeles. These gatherings continue to bring together multiple generations and use arts practice as a springboard for observing and imagining a future of memory in the Japanese American community. Looking ahead, YMP hopes to call many Yonsei back to the Central Valley, as well as activate Yonsei who live there now, for a “Yonsei Homecoming” on Day of Remembrance weekend, set for Feb. 17-20, 2018. A variety of activities will span the three-day program, including memory journeys on Feb. 17, led by Yonsei Ambassadors, and a service project on Feb. 18. On Feb. 19, Saito and Masumoto are planning a public community healing ritual at the Fresno Assembly Center Memorial, located at the Fresno Fairgrounds. While the program on Feb. 19 will honor experiences of the Japanese American community in the Central Valley, the event also strives to make important connections with other communities’ current struggles for rights and justice. The Yonsei generation is uniquely multiracial and multicultural; working between and with solidarity amongst multiple identities is, for many Yonsei, part of daily life. “At this point, our community is tied together as much by our shared Japanese American experience as by our multicultural experience,” noted Mia Ayumi Malhotra, a poet and one of YMP’s Bay Area Yonsei collaborators. In this regard, the Yonsei generation is uniquely positioned to lead the next phase of memory work. The YMP’s founders are building a vision of Day of Remembrance to include many community voices. Ultimately, YMP’s memory work has the potential to be healing work, fueled by a renewed sense of hope — a clear-seeing, creative hope that dares to gather and act in the face of confusing and distressing times. To follow more of the Yonsei Memory Project, follow its Facebook page or email yonseimemoryproject@gmail.com. Brynn Saito is a Korean and Japanese American poet and educator. Born in Fresno, Calif., she is currently based in the San Francisco Bay Area. She is the author of two books of poetry, “Power Made Us Swoon” (2016) and “The Palace of Contemplating Departure” (2013), published by Red Hen Press.